December! You’re doing it! I hope you have been swept up in the joy of this season, and not the hustle, stressy parts. Those of you celebrating Hannukah, sorry I am a little late to the menu planning contribution. Something tells me if you celebrate, you've already had a few latkes. I am not well versed in Jewish cuisine, but we couldn’t let Hannukah pass by without a potato pancake. No matter what you celebrate, a crispy potato is a great dinner addition. 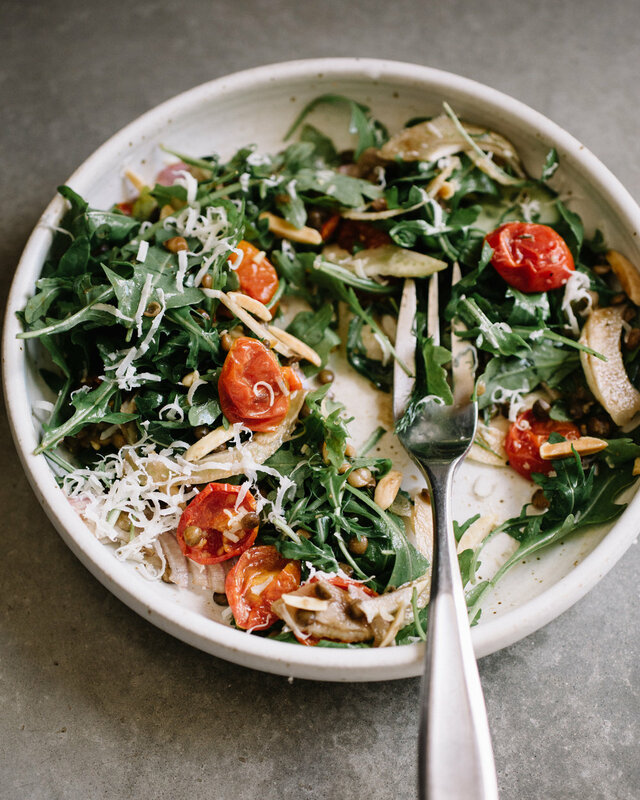 Winter salads are a little tough for me, but I like this chop - easy and accessible and repeatable. 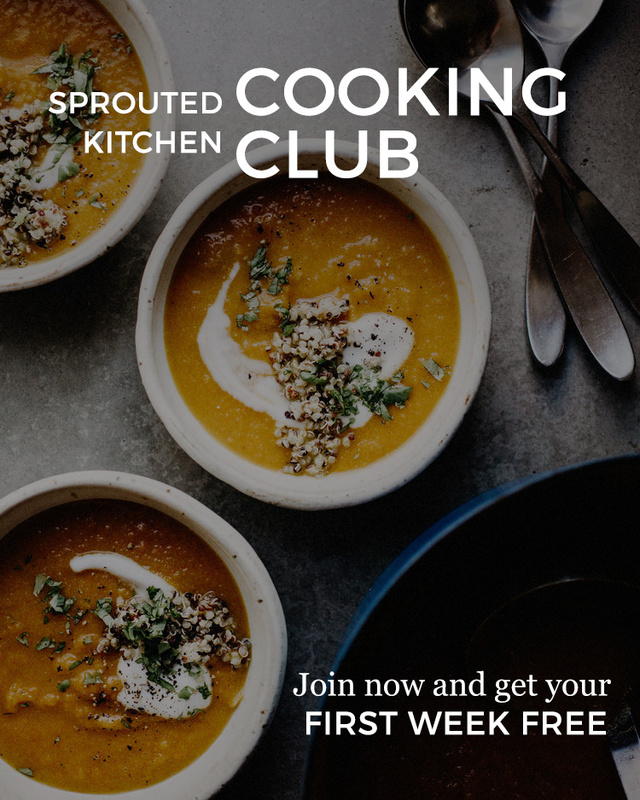 If you are wanting to gift a Cooking Club Membership (6-month or 1-year subscriptions) for the holidays, you can visit our shop page. There will be a slight price increase for new members starting Friday night, midnight ET, and this change will reflect in the gift subscriptions as well, so purchase asap if you’re interested! Thank you for your support! Most people would pan fry something like this, but I prefer baking my salmon. I find that the more gentle heat keeps the fish tender, whereas the hot pan seizes the proteins too fast and is easy to overcook. If you are going to swap in a white fish or use pounded chicken breast, you can do a shallow fry in a pan without consequence on texture. Add some sautéed greens or roasted broccolini if you want to add a green element here. make ahead: Roast the garlic. The cauli mash can be made in advance and reheated. You can also make the piccata sauce and bring it to room temperature before baking the fish. use it twice: Any extra salmon would be great served with a basic lemony pasta. vegitarian option: You can make the piccata sauce and add some cooked beans to spoon on top of the cauli mash. dairy free: Use non-dairy alternatives for both the cream and butter. Most markets sell alternatives to both. Preheat the oven to 400’. Cut the upper quarter off the head of garlic and rub a little bit of olive oil on the garlic face. Wrap the head in foil and place it in the oven for 30-40 minutes until the garlic is tender. Set aside to cool. Turn the oven down to 350’ for the salmon. While the garlic roasts, set a steam basket in a pot and bring the water to a gentle boil. Break the cauliflower into large florets, set them in the basket and steam until tender. About 8 minutes. Transfer them to a food processor to cool down. Add about 5 cloves of the roasted garlic (they should squish out of their pods), the cream or alternative, butter (or alternative) and a big pinch of salt and pepper. Process until smooth and fluffy. Add a small palmful of parsley and give it another pulse. Finish with a sprinkle of fresh pepper and parsley on top. Turn the oven down to 350’. Pat the salmon dry and season it with salt and pepper. Grease a baking dish and arrange the salmon, skin side down. Heat a saucepan over medium heat. Warm 1 Tbsp. of the butter, 1/4 tsp. salt, and the shallot and sauté just a minute until fragrant. Add the wine, and cook down to reduce by half, about 5 minutes. Whisk in the dijon and lemon juice and simmer another few minutes. Stir in the capers, remaining butter and small handful of parsley. Spoon the sauce over the salmon in the baking dish, top with some thin lemon slices, and put it on the middle rack of the oven. Bake for 15 minutes, or until desired doneness. Check the thickest part of the fish to feel like your outer palm when opened wide. This will vary by the thickness of the fish. 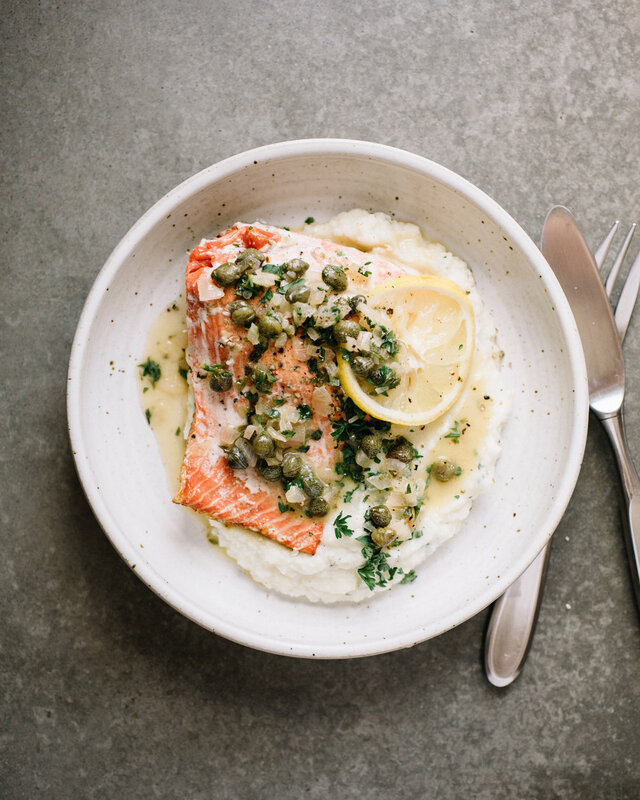 Serve the salmon on a bed of the cauliflower with a little extra parsley on top. You guys are so into the meal salads! I love to see your photos. I know they are not the best for kids, but I made a note about that below. You can get a thin, consistent shave of the vegetables with a mandolin, but careful knife skills work too. My heart wants to add fresh croutons here buttttttt I didn’t. If you have some fresh bread around, do it! I’m aware we’re off season with the tomatoes, but I’m still getting them in my veggie box so that’s my excuse. A jar of sun dried tomatoes is a great alternative! make ahead: The dressing can be prepared in advance. Chop/shave your vegetables in advance. use it twice: Make extra dressing. All salad components can be kept in tupperware, even in one large one, and added to lettuce as needed. extra credit: You can purchase sun-dried tomatoes in a can, I prefer the ones in oil over a dry pack, but they have a super strong flavor that some people don’t care for. To easily oven dry your own, preheat the oven to 350’. Halve a pint of baby tomatoes, toss them in a thin coat of oil, salt, pepper and some dried Italian herbs, and bake them on a rimmed baking sheet for 30 minutes. Remove to cool completely and then use them in salads. Shake all your dressing ingredients together in a jar, and set aside. In a large bowl, combine your arugula, red onion, cucumbers, lentils and fennel. If you dried the tomatoes yourself, toss them in. If you are using store-bought sun dried tomatoes, give those a rough chop, and add them. Add a drizzle of the dressing and toss everything to coat. Add the nuts and cheese, and give it another toss. If you are adding another protein, add that in too. Sprinkle a little extra nuts and cheese on top and enjoy. A wee bit late for Hannukah, oops. These are more of a side, but I think we can dress them up to taste. I’ll admit I used these in a mexican-breakfast-for-dinner which is no nod to Hannukah at all. They were a hit with the kids and the leftovers have toasted well. There has been a suggestion of sour cream and everything bagel seasoning which I think sounds delicious! Sweet potatoes contain more water than a russet, and I didn’t want to use a ton of flour to bind, so they will be fairly delicate. I suggest using a non-stick or well-seasoned cast iron pan so you won’t have to use quite as much oil to keep them from sticking. You can also bake them on a greased baking sheet at 425’ for about 12 minutes, flipping halfway through. make ahead: Grate the potatoes and onion. Wrap them in a dish towel and keep them in the fridge to stay dry. use it twice: As mentioned, these are great with eggs. Toast up leftovers and dip them in your favorite dip. gluten free: You can use a GF all-purpose blend in place of the regular flour. In a food processor with the grater blade, or on the large holes of a box grater, grate the sweet potato and onion together (watch your fingers!). In a large mixing bowl, whisk the egg. Stir in the flour, salt, pepper, and cayenne. Add the grated potatoes and onion to the egg mixture and stir to coat. Line a plate with paper towels. Heat a non-stick pan with a thin slick of avocado oil, over medium heat. When the oil is shimmering, make little piles of about 1/8 cup batter and drop them into the oil, pressing the top down flat. Repeat with however many can fit in the pan comfortably. Flip them when the underside is golden brown, about 3 minutes per side. Remove to the paper towel lined plate to drain. Repeat with remaining potato mixture, heating up another drizzle of oil between batches as needed. 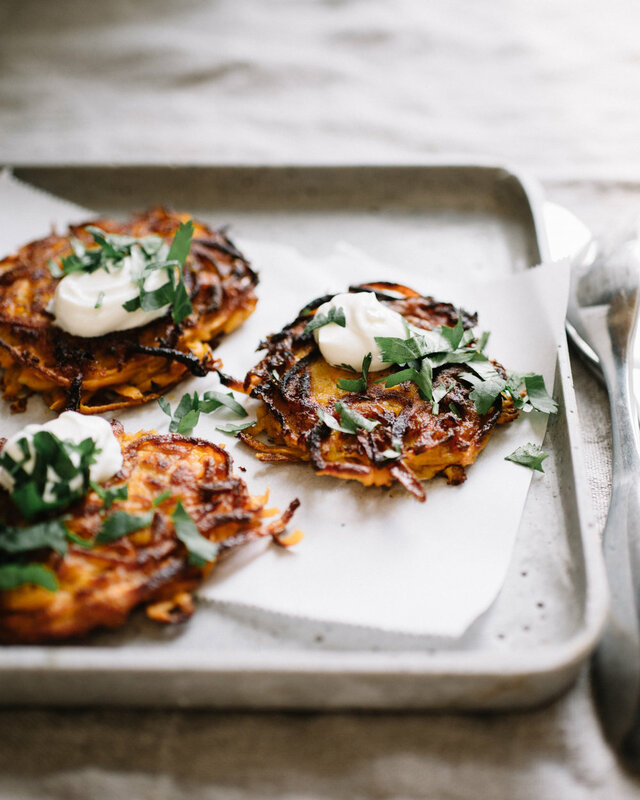 Serve the latkes with traditional toppings such as applesauce or sour cream, or spin them into a meal with eggs, avocado and cilantro. These are an old favorite from the blog. So so easy and they make a lovely gift too. Yes, you do need a mini muffin tin, but I’d argue you can put the mini wrappers in a larger tin and these will still work out. Or! Make large ones! I would be stoked if someone delivered those to my doorstep. Warm a double broiler, or a glass bowl over a pot of just simmering water (do not let the bottom of the bowl touch the water). Break up the chocolate into the bowl and let it melt, stirring occasionally. Let it cool down so it’s not piping hot, it’s easier to work with this way. In another bowl, stir the nut butter, honey, powdered sugar, vanilla and salt together to mix. Arrange the liners in a mini muffin tin. Add about a teaspoon of the chocolate and gently rotate the liner around so the chocolate runs up the sides a bit and coats the liner about 3/4 of the way up. 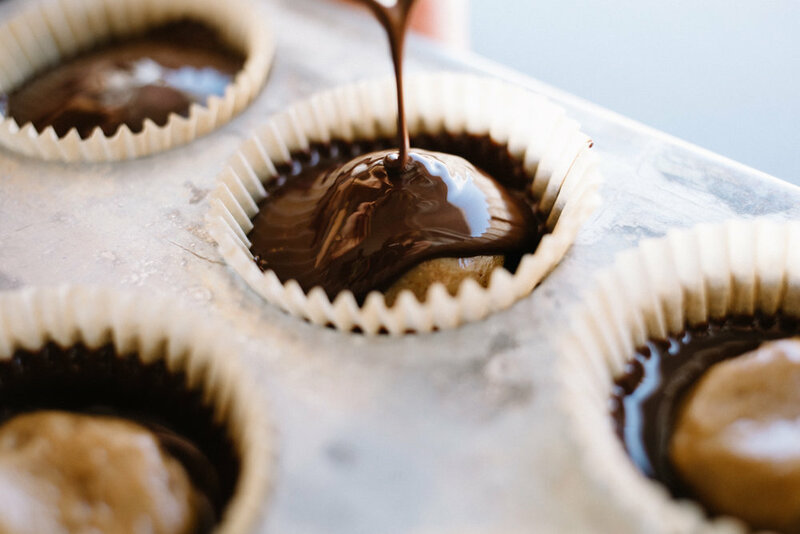 Scoop out a scant teaspoon of the nut butter filling, form it into a small ball, smush it into a patty, and float it in the center of it’s little chocolate puddle. Spoon more melted chocolate on top until the nut butter is just covered. Sprinkle a little flaky salt on top and let them chill in the fridge to set.